There are seven gates surrounding the Old City of Damascus and to pass through any of them is to enter a time warp, where you leave the present behind and step into a world of fantasy and make believe. Time has stood still in the oldest inhabited city in the world and all semblance of modernity has failed to penetrate its inner walls. Cars are almost non-existent and the sounds that you hear are of horse and donkey hooves and the myriad of footsteps in the narrow, cobbled alleyways. Go by night when darkness settles over the city and Damascenes flock to the sanctuary of this place in search of spiritual guidance, shopping or just the wonderful conviviality of its people. Step into the Hamidiyeh Souk just beside the Citadel, immortalised by Saladin and immerse yourself in the throngs of people searching for bargains amongst the shopkeepers and traders lining the street. Shafts of moonlight descend from the corrugated roof through the bullet holes left by the French machine gunners during their occupation. 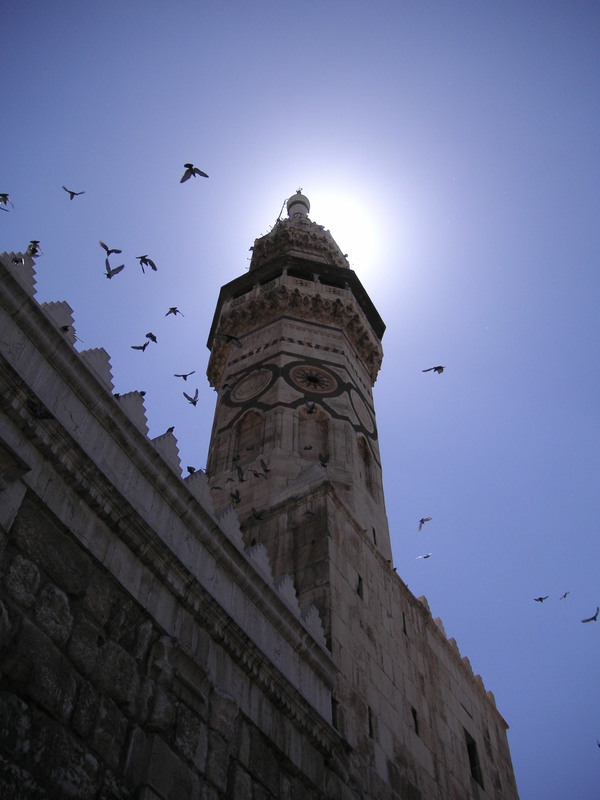 At the end, you reach the Ummayyad Mosque with its imposing bronze door and its three minarets rising into the night sky. To enter this sanctuary is to enter one of the most important shrines in the Islamic world .Yet this is no sombre place. Children run around wildly playing hide and seek; families huddle around chatting and clerics move around with their flock in tow. Many just sit cross-legged and stare at the immense beauty of the place. Step inside the Prayer Hall bedecked with thousands of multi-coloured carpets and watch the men praying, the pilgrims admiring the Shrine of St John the Baptist and the beautiful, decorative ceilings. Head up towards Straight Street (Via Recta) through the labyrinth of winding alleyways past thousands of ornate doors and enter the Christian quarter renowned for St.Anania’s Chapel named after the man who restored Saul’s sight and Bab Kisan, where Paul escaped in a basket. Here the throngs have gone and a quiet tranquillity settles over you as the alleyways become darker and more obscure. Yet there is no need to be frightened here. The Damascenes are renowned for their hospitality and no harm will come to you. Savour the moment and enter one of the many beautifully, ornate restaurants. Elissars with its hanging gardens, water fountains and wonderfully laconic Urd players; Leila’s with its roof top terrace overlooking the brightly illuminated mosque; or small coffee houses squeezed in between the narrow houses with their balconies perched precariously over the alleyways.